Showcasing your photography is vital in the digital age – so much so that to lack an online presence can make you seem behind the times. What’s more, you may have already recognized you need a website, but perhaps your choice of theme leaves your design looking outdated. That’s not a good situation to be in. The WordPress.org Theme Directory is a fine place to begin your search for a modern, stylish photography theme. However, its search features are sorely lacking. This means a potential trawl through hundreds of themes in order to find the right one – unless you get some expert advice, that is. In this post, we’ve done the hard work for you. We’ve presented six of the best free photography themes currently on the WordPress.org Theme Directory. By the end, you’ll know exactly which one to go for. However, this post is focused on the WordPress.org Theme Directory – a repository containing thousands of themes that cover all manner of niches (including photography, of course). What’s more, themes have to pass a vetting procedure to be included, and they’re regularly checked to ensure that only the very best are found within the directory. Let’s now take a look at six of the best free photography themes on the WordPress.org Theme Directory. We’ve narrowed down the choices based on a number of considerations – reviews and ratings are a primary concern, but we’ve also looked at how recently each theme was updated. That way, you’re more likely to choose a safe and secure theme that works with the current version of WordPress. Let’s begin with an aptly-named choice. Overall, this is a solid theme for showcasing your projects, and there’s also an upgrade path for those who need even more functionality than what’s already included. In a nutshell, Portfolio Gallery does the simple things well. 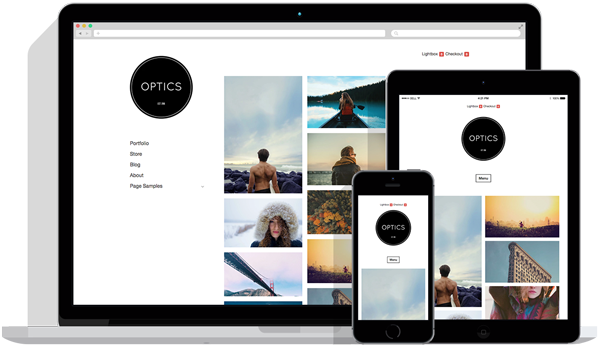 It’s a modern-looking example of how to create a free photography theme, and a premium version is available for those wishing to stick with it long-term. There’s plenty on offer from Pixgraphy – a simple-to-grasp theme with a modern design. When creating a stock photography site, there are arguably few themes that can better it. It’s compatible with the Page Builder by SiteOrigin plugin. There are a number of customization options found within the Customizer, such as a sticky header. WooCommerce is fully integrated into the theme. Like some of the other themes on this list, there is also a premium option available – but the functionality offered in the free version will be more than enough for most who are looking to both showcase and sell their work. Freedom doesn’t seem to do much on paper, but it offers a basic way to get your photography online, without the features you don’t need. What’s more, the premium version offers even more customization options, making this a stellar option for long-term users. There’s plenty to love about Tracks – and for photobloggers especially, this may be the pick of the bunch. It doesn’t offer a lot of functions, but all the essentials you need to get started are present. Overall, it’s a stand-up theme that deserves your attention, pronto! Choosing a theme is always challenging – more so when you have so many options at your fingertips. While the WordPress.org Theme Directory should be your first stop, finding the right theme without the ability to filter by user ratings can make your job more difficult. In this piece, we’ve offered six of the best free photography themes on the WordPress.org Theme Directory. Some are designed for displaying your portfolio (Electa and Portfolio Gallery), others can be adapted to stock photography sites (such as Pixgraphy and FotoGraphy), while photobloggers will likely prefer Freedom and Tracks. Do you have a favorite free theme on the WordPress.org Theme Directory? Let us know in the comments section below! This entry was posted in Blog, Themes and tagged photography themes. Bookmark the permalink.